Allie is originally from Chester, New Jersey. She was a member of the program from 2014 until 2017, and was a competing member of teams that were the national runner-up in 2016 and national champions in 2017. 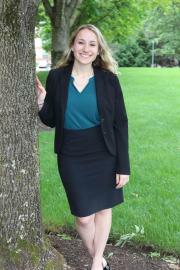 As a competitor, Allie won 13 individual awards as both a witness and and attorney, including three All-American Attorney awards. Allie also served as the program’s Executive Vice President for two years. Following graduation, Allie attended law school at the University of Chicago. View Alexandria's career individual awards by clicking here.